Belfairs members celebrated the inauguration of their new captains last week. On Thursday, Ladies Captain Mandy Moir adopted a cycling theme for her drive-in and accompanied by a cacophony of bicycle bells and hooters from the gathered audience, hit a fine tee shot to the par 3 1st hole. On Sunday it was the turn of Ian Mudie to drive in as Club Captain. 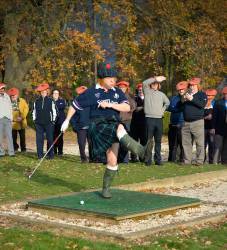 Dressed in kilt and national football shirt, Ian’s theme was a tribute to his native Scotland and each of the assembled members and guests were given tam o’ shanter’s to wear.at the 1st tee. Unfortunately, the sartorial splendour was not matched by the drive as Ian’s first tee-shot as captain promptly went out of bounds!